TROX swirl diffusers of the RFD type are suitable for deployment in the commercial and industrial sectors, and are available in square and round design. They consist of the diffuser face and the rear plenum box with round duct connection spigot on the side. The design of these swirl diffusers guarantees a swift reduction in temperature and flow velocity by means of swirling discharge and the addition of induction air. The sound power level is low. They are suitable for use both in systems with constant volume flow and in VAV systems. Volume flow ranges between 100% and 25% are possible. 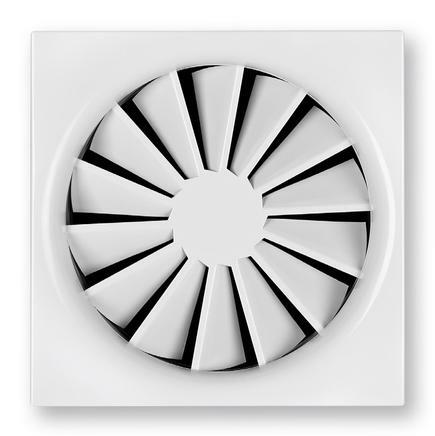 Swirl diffusers of the RFD type are suitable for all types of installation: in closed ceilings, above open grid ceilings and in ceiling panels (max. thickness 20 mm) by means of spring clamps.